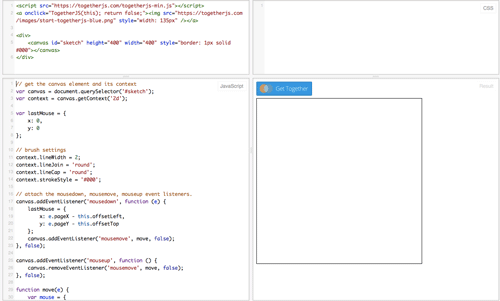 We’d like to introduce TogetherJS, a real-time collaboration tool out of Mozilla Labs. TogetherJS is a service you add to an existing website to add real-time collaboration features. Using the tool two or more visitors on a website or web application can see each other’s mouse/cursor position, clicks, track each other’s browsing, edit forms together, watch videos together, and chat via audio and WebRTC. Many of TogetherJS’s features require no modification of your site. TogetherJS looks at the DOM and determines much of what it should do that way – it detects the form fields, detects some editors like CodeMirror and Ace, and injects its toolbar into your page. 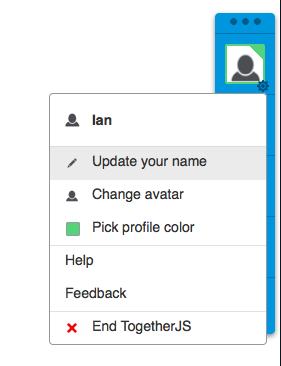 Just click on Collaboration and it will start TogetherJS. 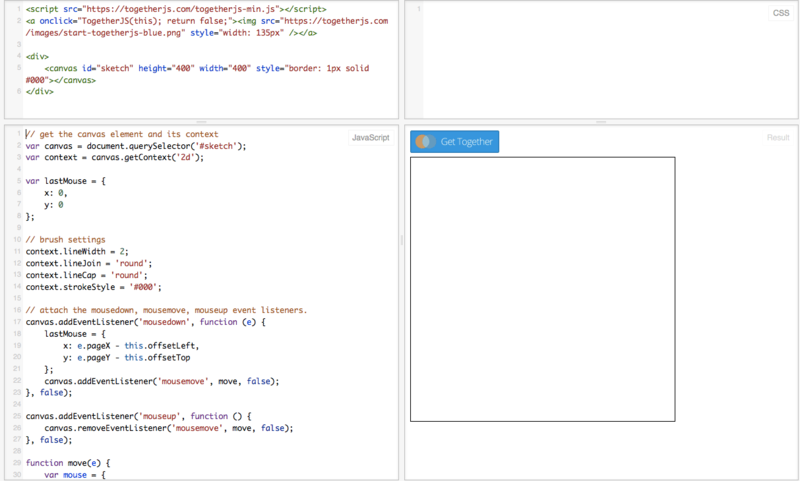 You can also use TogetherJS in your fiddles, as we’ll show below. 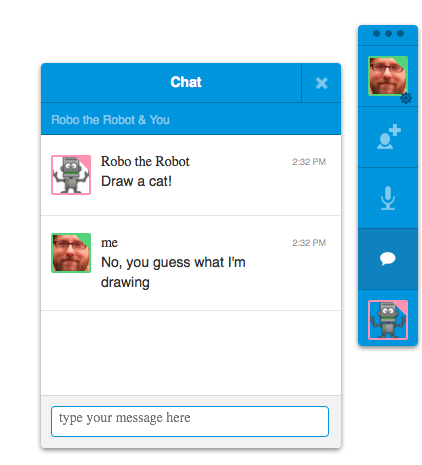 To give an example we’d like to use a simple drawing application. We’ve published the complete example as a fiddle which you can fork and play with yourself. This is enough code to give us a very simple drawing application. At this point if you enable TogetherJS on this application you will see the other person move around and see their mouse cursor and clicks, but you won’t see drawing. Let’s fix that! The message types are namespaced so that your application messages won’t accidentally overlap with TogetherJS’s own messages. Before we send we check that TogetherJS is actually running (TogetherJS.running). The message we send should be self-explanatory. We don’t have to worry about whether TogetherJS is running when we register this listener, it can only be called when TogetherJS is running. This is enough to make our drawing live and collaborative. But there’s one thing we’re missing: if I start drawing an image, and you join me, you’ll only see the new lines I draw, you won’t see the image I’ve already drawn. We used a fixed-size canvas so that we didn’t have to deal with two clients and two different resolutions. Generally TogetherJS handles different kinds of clients and using resolution-independent positioning (and even works with responsive design). One approach to fix this might be to ensure a fixed aspect ratio, and then use percentages of the height/width for all the drawing positions. We don’t have any fun drawing tools! Probably you wouldn’t want to synchronize the tools themselves – if I’m drawing with a red brush, there’s no reason you can’t be drawing with a green brush at the same time. But something like clearing the canvas should be synchronized. We don’t save or load any drawings. Once the drawing application has save and load you may have to think more about what you want to synchronize. If I have created a picture, saved it, and then return to the site to join your session, will your image overwrite mine? Putting each image at a unique URL will make it clearer whose image everyone is intending to edit. Want To Look At More? Curious about the architecture of TogetherJS? Read the technology overview. Find us via the button in the documentation: “Get Live Help” which will ask to start a TogetherJS session with one of us. Find us on IRC in #togetherjs on irc.mozilla.org. Find the code on GitHub, and please open an issue if you see a bug or have a feature request. Don’t be shy, we are interested in lots of kinds of feedback via issues: ideas, potential use cases (and challenges coming from those use cases), questions that don’t seem to be answered via our documentation (each of which also implies a bug in our documentation), telling us about potentially synergistic applications. Follow us on Twitter: @togetherjs. What kind of sites would you like to see TogetherJS on? We’d love to hear in the comments. This is great. Collaboration is the main use case for realtime web technologies that I feel we need to see innovation in. Presently we seem to have hit a wall with editing documents like Google docs and Cloud9 IDE, share agile/scrum boards and todo lists. It’s not that these aren’t amazing and very useful. It’s just they’ve been around for a while and I want to see what’s next. Would it be worth clarifying browser support for TogetherJS? The reason for this is TogetherJS seems set up to allow *anybody* to add it to their site. But without the “installer” being aware of these requirements they may frequently wonder why some users aren’t getting the expected functionality. Maybe TogetherJS provides a callback to indicate when one of the requirements isn’t present or a connection can’t be made to the Hub? When it comes to web browser support, it’s outlined in the documentation for TogetherJS. It is an interesting thought about warning implementers, though, and potentially worth adding. Thanks Ivan, we hope you will find good use for it! Also it should be possible to use different sorts of servers. There was an experiment to substitute Firebase, for instance: https://github.com/firebase/togetherjs – I’m hoping we can take that and generalize it. I would love to see that on etherpad lite to be honest. I second this, that would be fantastic. Or just the chat would be great too. This is potentially huge. Business collaboration is one major use case, and probably where it’ll see the most use, as you’ve discussed – but in a lot of ways, I’m looking forward to the first game to be written with this. It could also open the door to new kinds of discussion platforms. Thanks Ben – and definitely, it could be very interesting in games! Although I may be able to get a demo working with Together.js, I expect to be busy for a while with improving WebAppFind and hopefully completing ExecuteBuilder, another add-on which aims to facilitate the building of executables usable by WebAppFind with the added ability to open web apps in a separate task bar instance (via separate profiles), thereby mimicking the former Prism project behavior. So, if anyone is eager to get this working sooner, be my guest! It would be pretty darn cool not only to allow WYSIWYG word processing of local HTML/SVG/image files as WebAppFind allows, but with the collaboration features of Together.js. (I also hope to add WebAppFind’s functionality to filebrowser-enhanced: https://addons.mozilla.org/en-US/firefox/addon/filebrowser-enhanced/ so one would be able to open local files in web apps via Firefox’s own desktop browsing pages). Feel free to report ideas through the issues tracker or submit pull requests! Thanks for the heads-up, Brett! Hey! We were able to get TogetherJS into a extension for Review Board (web-based code review tool). We’re really excited to see what the possibilities are for making code review more collaborative with technologies like TogetherJS. Keep up the great work! I’ve edited the wiki to include a link to the GH repo. Thanks! What about making a browser extension out of this, so you can enable together.js on every website? :) Click the browser extension, together.js get injected in the page, share the link w friend, together gets injected in their page. I just had the exact same idea. I’ll try it when I get home tonight. Ultimately I am afraid it won’t be a great experience to use an addon. Just in the way the drawing app doesn’t really work without some integration, I expect similar experiences on a lot of sites. This is just great! One question, would it be possible to continue the session if the web app opened up a new browser tab? 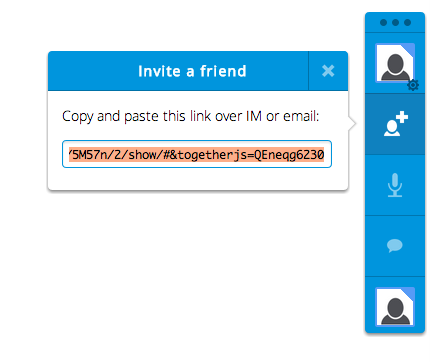 Any link in a new tab has to have the #&togetherjs=SESSION_ID on the URL. If you can rewrite the link to include that, then yes, the session will continue in both tabs. I don’t understand the documentation about browser support. It’s made clear that IE support is not a priority (although it’s not stated why) but there’s zero mention of Safari, even though WebSockets also works on there (both OS/X and iOS). Is there some other obvious problem with supporting TogetherJS on Safari? Stepping back the question is about the brand promise of TogetherJS wrt the Open Web Platform. It’s described as “a real-time collaboration tool… you add to an existing website”. But who wants to add something to an existing website that doesn’t work for half of our visitors? I would love to see a clear statement in the docs that the intention is for TogetherJS to work on all modern browsers and any temporary problems are simply (understandable) ramp-up issues. Anyone packaged this as a WordPress widget? It is even more awesome when you package it as a bookmarklet. Click and collaborate on a given page. Hi, how to ignore some form elements if we don’t want TogetherJS to pass their content? Geezus you guys are so cool, we <3 Mozilla! you can also view http://www.ucodeme.com that has togtherJS embedded. Fantastic work great tool guys!